One of the legacies of the apartheid years in South Africa is a persistently high unemployment rate. 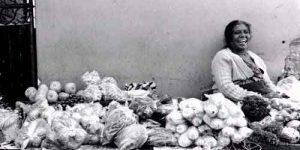 Since the 1970s South Africa’s performance in dealing with persistent unemployment has been dismal (Du Toit and Koekemoer 2003: 49). This is so despite the fact that the ANC, South Africa’s premier political party, committed itself in 2009 to five priorities – education, health, rural development, the fight against crime, and creating decent work (ANC Today 2009: 1). Many reasons have been cited for poor or jobless growth in South Africa (Du Plessis and Smit 2007: 13-5). These include labour market inflexibility and new labour legislation enacted after 1994 (Barker, 2003: 226-7; Burger and Woolard 2005: 3), a mismatch between the required skills levels, the labour force, and employment opportunities (Burger and Woolard 2005; 21-2; Pauw Oosthuizen and Van der Westhuizen 2008: 45-57), concerns over a perceived increase in the capital intensity of production (Bhorat and Oosthuizen 2006; 239-40; Pauw Oosthuizen and Van der Westhuizen 2008: 45-57), increased concentration in the manufacturing sector (Fedderke and Szalontai 2003: 1), sectoral changes in demand (Bhorat and Oosthuizen 2006: 246; Banerjee et al. 2006: 1-26) and the impacts of the high prevalence of HIV/AIDS in South Africa (Arndt and Lewis 2000: 11; Ford, Lewis and Bates 2002: 10-17). No one of these explanations relates to the dominant strategic position of South African enterprises or the overall nature of the technology used in the country. It is the contention of this chapter that these two issues are ignored (or perhaps even willfully disregarded) in South Africa, thereby contributing to an inability to understand the essential nature of the persistent unemployment problem. The aim of the chapter is, therefore, to demonstrate that ignorance and/or disregard of the importance of strategic positioning and the nature of the technology applied could result in a systemic inability to overcome the unemployment problems. To develop the line of reasoning, two fundamental choices of entrepreneurs about strategic positioning and the nature of technology are firstly linked to some seminal thinking. Then a metaphor, namely the playing field, is used to further elucidate these issues. The South African economy is positioned in terms of the playing field and is followed by an analysis of what happens to commodity-producers and workers during globalisation. 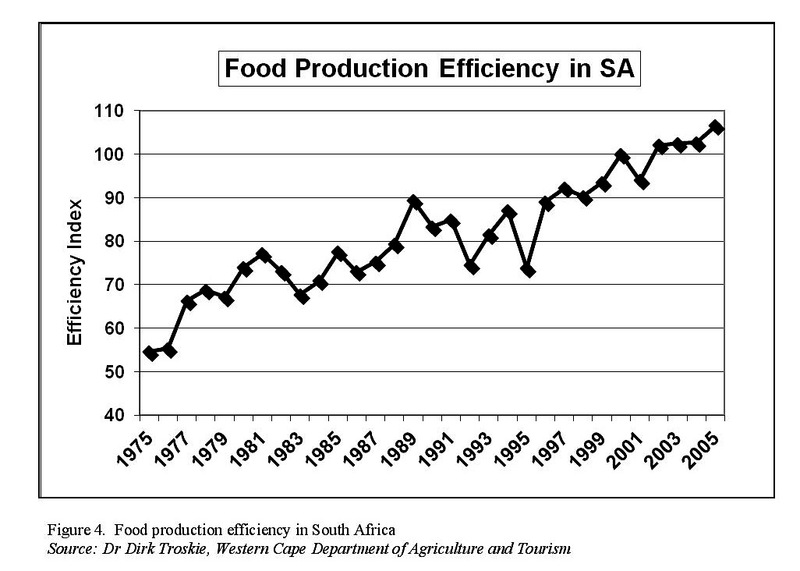 The South African agricultural industry is used to sketch the dynamics of this process. Reference is made to the ‘Château Margaux paradox’ before the South African wine industry is used as an example of a sustainable low-tech industry. The implications and consequences of the ignorance and disregard of strategic positioning and the nature of technology are then discussed in detail, including the conundrum of balancing the production of commodities, earning foreign exchange, and job creation/destruction. Finally a broad solution is offered for consideration in South Africa and elsewhere. Two of the first fundamental choices faced by entrepreneurs wherever they may be and whatever they plan to do are what type(s) of products/services will be produced/delivered and how will competitiveness be achieved? 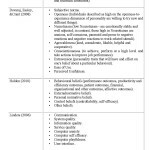 Porter (1980: 35) identified three generic competitive strategies, namely cost leadership, differentiation and focus. Cost leadership is necessary to provide sustainable competitiveness when enterprises compete with commodity products or services. Differentiation is necessary when enterprises use the uniqueness of products and/or services to achieve competitiveness. Focus is a strategy that utilises a blend of cost leadership and differentiation to achieve competitiveness, i.e. it uses a combination of cost control and product/service uniqueness to serve specific niche markets. Another fundamental choice of entrepreneurs is the nature of the technology that will be used to produce/deliver its products/services. Rifkin (1996: 59-197) examined the relentless march of technology and its negative impact on jobs. He presented the two faces of technology: one that benefits man by continuously broadening his abilities to perform tasks, and hence, to expand his business opportunities (and his ability to create new types of jobs), and the other, which through the use of smart machines and technologies in industry after industry results in the ‘machines in, humans out’ phenomenon, thus harming some people by making their jobs redundant. Technologies range from those available to all to those available to only a few. The terms low technology (or low-tech, indicating wide availability) and high technology (or high-tech, indicating selective availability) are widely used to illustrate the two broad technology domains of the technology continuum. The kind of technology used in an enterprise, at least in its broad forms as explained above, is therefore also of strategic importance. Athletes, administrators and sports lovers will immediately recognise a schematic outline of the playing field on which their favourite sport, be it soccer, rugby, golf, cricket, baseball, tennis, etc., is played. Each playing field creates an area within which a specific sport can be played; outside the boundaries no formal game is possible. The fans and players have knowledge of the rules of the game in relation to the playing field. There is an appreciation of strategies and tactics that could lead to success (a win) and ample scope for the creative development of new strategies. 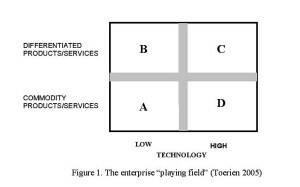 Toerien (2005) argued that the nature of technology used and strategic positioning are the two important elements that define another playing field, namely the enterprise or competitive ‘playing field’ where new enterprises and all existing enterprises ‘play’. It is bounded by two continuums relating on the one hand to technology and on the other to strategic (competitive) positioning. Lines on a soccer or rugby field help to define the positions of competitors and help in the choice of applicable strategies and tactics. 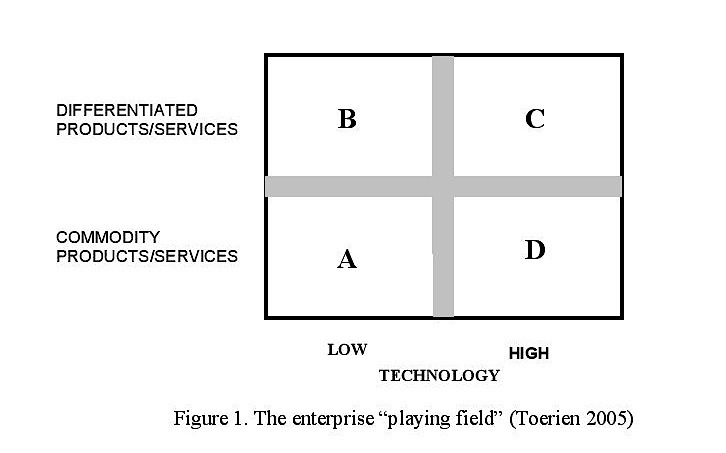 Similarly Toerien’s division of the continuums of the enterprise playing field as shown in Figure 1 helps entrepreneurs and others to understand their strategic positioning and helps to identify applicable tactics (Toerien 2005). 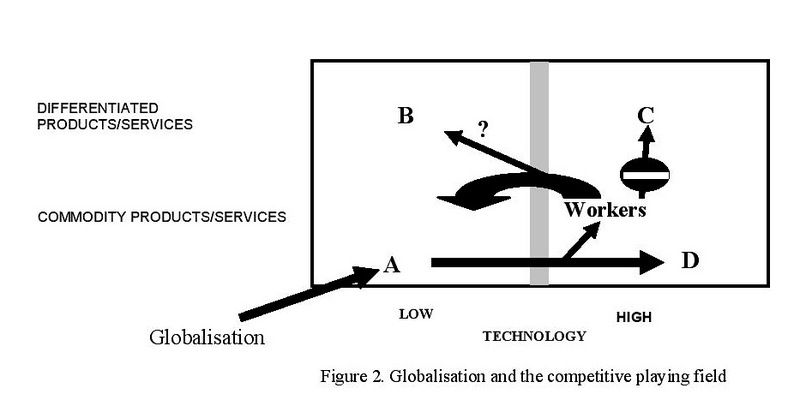 In domain A entrepreneurs use low technology to compete with commodity products and/or services (Toerien 2005: 65-87). Cost leadership or at least cost parity is needed if the product is to be competitive. Competition in this domain can be fierce, often ending in ‘a race to the bottom’. Entrepreneurs in this domain will in the face of fierce competition often resort to the use of higher technology (i.e. a shift to domain D) to remain competitive and profitable. In domain B entrepreneurs use low technology to compete with differentiated products and/or services. Some enterprises in this domain are centuries old and yet are still very competitive; they have not succumbed to the ‘race to the bottom’. This presents a paradox that needs to be resolved (see later). Competitiveness in this domain is primarily based on human talent and/or know-how and/or attractions (Toerien, 2005: 88-99). Additional success factors include brand building, quality and logistics management, marketing and product innovation (Toerien 2005: 88-99). In domain C entrepreneurs use high-tech means to produce differentiated products and/or services. Product or service uniqueness confers competitiveness, and cutting-edge science and technology and the availability of risk capital are prime success factors (Toerien 2005: 100-8). In domain D entrepreneurs use high-tech means to compete with commodity products and/or services. Cost leadership is needed to confer competitiveness on the domain’s commodity products and/or services, and process automation and computerisation are strategies that are often used by entrepreneurs in this domain to achieve it (Toerien 2005: 109-116). Kennedy (1993: 93) remarked about automation: ‘If that was already possible in the mid-1980s, what degree of manufacturing efficiency might the robotics revolution achieve by 2020?’ He foresaw the increased use of smart machines and the continuation of the ‘machines in, humans out’ phenomenon. The enterprise playing field differs from sport playing fields in one significant way; its borders are not totally fixed. New scientific discoveries and technological developments are continuously expanding the border of the high-tech end of the technology continuum. At the same time more and more technologies also become ubiquitous, thus expanding the low-tech end of the technology continuum. These dynamics must be taken into account. Vehicles (and their parts), mining equipment, wine, manufactured coins and household furniture (the latter may also reflect items exported by emigrants from the country) were the only major export sectors with differentiated goods and their contribution to the top 25 exports ranged from 20 to 21 percent in the period 2005 to 2009. 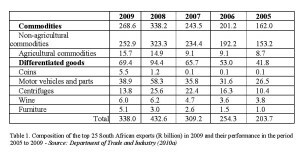 South Africa’s economy is focused mainly on commodities the export of which is its major source of foreign currency, and it clearly suffers from the ‘resource curse’ (Table 1). The country’s economy is, therefore, predominantly positioned in domain A. There is a lesser presence in domains D and B whilst domain C remains weak (Toerien 2005: 124-131). The implications of this strategic positioning must be understood especially in terms of one of the dominant driving forces in the world, namely globalisation (Stiglitz 2003: ix-x). Joseph Stiglitz, winner of the Nobel Prize in economics, asked: ‘Why has globalisation, a force that has brought so much good, become so controversial?’ (Stiglitz 2003: 4). He added that a growing divide between haves and have-nots has left increasing numbers in the Third World in dire poverty. Clearly globalisation has not succeeded in reducing poverty and ensuring stability in developing countries. South Africa’s persistent high unemployment rate is probably a further manifestation of the kind of problems addressed by Stiglitz (2003). The competitive playing field helps us to visualise these problems in a systemic manner (Figure 2). Globalisation forces competition onto domain A enterprises. To survive or maintain profitability they are forced to increase their productivity and turn to the use of higher technology, i.e. they move towards higher technology (domain D) as shown by Rifkin (1996), and shed workers in the process. There is little knowledge of and experience about how to migrate redundant workers to domain B and because of their lack of education and skills a move to domain C is not possible. 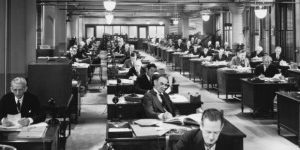 Redundant workers are therefore usually (and only if jobs are available) again accommodated in domain A enterprises, thereby subjecting them once more to the same pressures. in this industry. 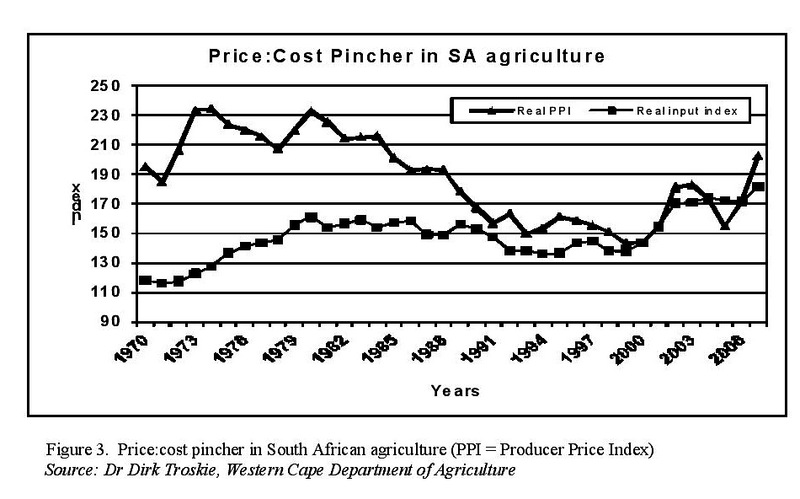 South African commercial agriculture has been caught in a price-cost pincher for decades (Troskie 2010) (Figure 3). The producer price index (the PPI) steadily declined until the end of the previous century and then increased somewhat. The real input index increased from 1971, then remained reasonably constant for two decades but has recently again accelerated. Continuous price pressures are exerted on commercial farmers. Their profits have been steadily eroded, creating a situation where one bad year could wipe out a farmer. How have commercial farmers responded to these pressures? Two major strategies are evident: (i) seeking economies of scale, and, (ii) resorting to the increased use of technology. The Census of Commercial Agricultural of 2002 (Statistics South Africa, 2004) indicated that the number of commercial farming operations decreased from 57 980 in 1993 to 45 818 in 2002. This is a clear indication that many commercial farmers sought increased economies of scale in their operations; larger farmers bought out smaller farmers. 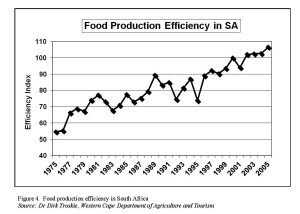 The increased food productivity in South Africa (Troskie 2010) (Figure 4) suggests that farmers also resorted to higher technologies (more complex agricultural equipment, improved plant varieties, etc.) to increase yields and reduce their risks. Did these strategies lead to fewer workers in agriculture? 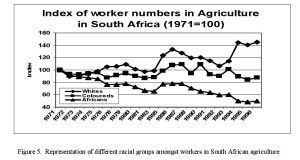 Long-term statistics of the Department of Agriculture (2008) help to answer this question, especially when the data for three racial groups (Africans, whites and coloureds) are normalised to allow relative comparisons between the different groups (Figure 5). The number of Africans (the least educated and trained group) nearly halved (from about 1.4 million workers to about 700 000) between 1971 and 1996. The numbers of coloureds decreased by about 10% whilst the numbers of whites (the best educated group) increased by about 40 per cent. These results support a hypothesis that the introduction of sophisticated technologies (including smart machines) in agriculture did not only decrease the requirements for ordinary workers (mainly poorly-schooled African workers) but increased the need for knowledge workers (at the moment mainly white workers) required to operate and maintain more sophisticated equipment. What happened to the workers made redundant in agriculture? Atkinson (2007) examined the plight of farm workers in arid South Africa. She suggested (Atkinson 2007: 111-31) that they moved to places with perceived economic prospects, e.g. to towns. Analyses done for the Hessequa Municipality (2005) using data from the 1996 and 2001 censuses in South Africa (there was unfortunately no census in 2006) also suggested that in this rural area, redundant workers moved to the nearest towns, where there were mostly few, if any, employment opportunities. Farm worker migrations or evictions have also been observed in other rural areas in South Africa (e.g. Aliber, Greenberg, Kleinbooi, Lahiff and Tom 2006: 5). In addition to other factors described fully by Atkinson (2007), competitive pressures clearly forced commercial farmers to seek technological remedies and economies of scale to help maintain their profitability. In the process their operations shed workers. 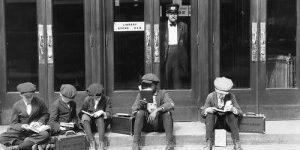 These redundant workers became a burden on the rest of society who now had to help carry their needs for housing and welfare. Increased socio-economic problems in urban centres were often also encountered. The above dynamics have to be considered against a paradox, which I call the Château Margaux paradox. Thomas Jefferson, involved in drafting the American Constitution and later the President of the USA, loved drinking the wines of Château Margaux in the late 18th century (Gabler 1995: 117). More than two hundred years later Château Margaux is still one of France’s premier wineries. General economic theories fail to explain the paradox of why wineries such as Château Margaux (and enterprises of some other low-tech industries) are able to escape the forces that lead to the commoditisation of products and services (the ‘race to the bottom’). This prompts consideration of the South African wine industry. Soon after the release of Nelson Mandela and the founding of the new democratic South Africa in 1994 this industry managed to improve its position drastically (Figure 6) (SAWIS, 2003: 1-6; Ponte and Ewert 2007: 17). By 2003, the industry provided more than 200 000 jobs throughout the economy, 103 800 of which were directly linked to the wine industry. Tourism in the wine industry was directly and indirectly responsible for more than 48 000 job opportunities. 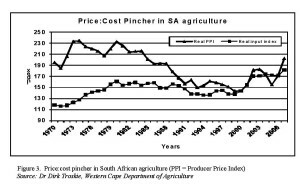 This was during the same time that the rest of the agricultural sector was facing extreme price pressures (Figure 2) and shedding jobs (Figure 5). Why could the South African wine industry manage to do so well whilst the rest of the agricultural sector was under enormous price pressures? Does the wine industry have smarter farmers and entrepreneurs? Obviously not. Toerien (2005: 129-30) suggested that the answer must be sought in the nature of the industry, i.e. its ability to produce products based on talent and know-how and which can be clearly differentiated from those of competitors elsewhere. The talents of the industry’s viticulturists and winemakers provide the essential human abilities to produce great wines from high-quality grapes. Like Château Margaux, South African wineries such as Nederburg (Brooke Simons 1992) have produced great wines for centuries and will probably continue to do so for centuries to come. The prime lesson from the wine industry is clear. 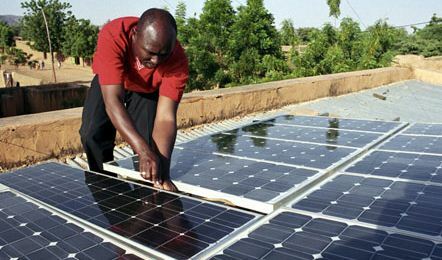 It is possible in the right circumstances to build low-tech sustainable enterprises and industries that provide significant and sustainable employment opportunities in countries such as South Africa. The challenge is to create these enterprises and industries. Having examined the four broad competitive domains one needs to remember that athletes move around their playing fields whilst competing and within the bounds of the rules of their game. On the playing field and within the ‘rules of the game’ they have the freedom to employ all kinds of strategies and tactics to achieve their goals. What is the situation as far as enterprises are concerned? Enterprises can also change position as a result of changes in strategy or tactics. Porter (1980, 1985, 1990) provided numerous examples of strategies adopted by winning enterprises and countries, many of which required pursuing different competitive positions. Businesses move (or have to move) from one strategic position to another and this has all kinds of implications that should be considered in business or economic development strategies and policies (Toerien 2005: 157-179). If the ‘players’ (enterprises), ‘administrators’ (bureaucrats), ‘referees’ (politicians) and other ‘interested and affected parties’ (e.g. the labour unions) do not understand the competitive playing field and its concomitant ‘rules of the game’, chaos could follow and counter-productive decisions and strategies could be chosen and implemented. The realities, dangers and implications of such a situation are now discussed using South African agriculture as a proxy for all the commodity sectors of the country’s economy. In this process some important questions are raised and significant issues opened up for debate. South African commercial agriculture produces mostly commodities that are in fierce competition globally with the products of commodity producers in other countries. This is true for large as well as small farming operations. These agricultural commodity producers have for decades, and will in the foreseeable future, be subject to a severe price/cost pincher, which forces them to seek the control and reduction of costs in order to remain viable. They will continue to seek economies of scale, use more sophisticated (and smart) equipment and exploit better plant varieties and stock breeds. These practices will continue to make more low-level agricultural workers redundant. The workers will migrate to (mostly rural) urban centres where limited employment prospects abound, adding to the country’s socio-economic problems. The use of smart machines in agriculture will require additional technically skilled operators. Farmers will continue to pursue strategies designed to protect their profitability without much concern for the secondary problems that their survival strategies create in nearby urban communities, e.g. the increased need for housing and the higher incidence of socio-economic problems. There is not yet a mutually agreed social contract between farmers, farm workers, the government and close-by urban communities. Such a contract should ideally include: (i) clear government policies to ensure food security in South Africa, (ii) the extent to which commercial farmers will be helped by the government to remain competitive, (iii) the extent to which commercial farmers will train their workers not only in skills important to commercial farming but also in life skills and technical and other skills that would prepare them for non-agricultural careers should such a need arise, and (iv) the extent to which urban communities should become responsible for the secondary problems that stem from the survival strategies of local commercial farmers. Many ethical issues and implications of the above have not yet been examined in a coherent fashion. For instance, how should the balance between the maintenance of the competitiveness of industries such as mining and agriculture that earn much-needed foreign currency for the country be balanced with the need to maintain jobs for low-level workers? What social contracts are consciously or by implication operative in South Africa, and are these ethically justifiable? The land redistribution (South African Government 2010) and Black Economic Empowerment (South African Government Information 2010) programmes of the South African government require the transfer of land from (largely experienced) white commercial farmers to (largely inexperienced) black farmers. Newly established small farmers who are positioned to produce (and compete with) commodity products will be subject to the same harsh competition faced by large-scale commercial farmers but will not have the means, i.e. the agricultural knowledge, the ability to acquire and use advanced technologies or to increase the scale of their operations that would enable them to adopt the survival strategies available to large commercial farmers. Will these farmers be doomed to failure? Labour unions face a particularly tough challenge. The unions, particularly those operating under the banner of the Congress of South African Trade Unions (Cosatu), vehemently oppose any reduction of the number of general worker. How will these unions accommodate holistic solutions whereby commercial farmers, the government, workers and communities could benefit simultaneously? The challenges for the government (politicians as well as bureaucrats) to deal with in this context are significant. Will the government be able to rise to the challenge? 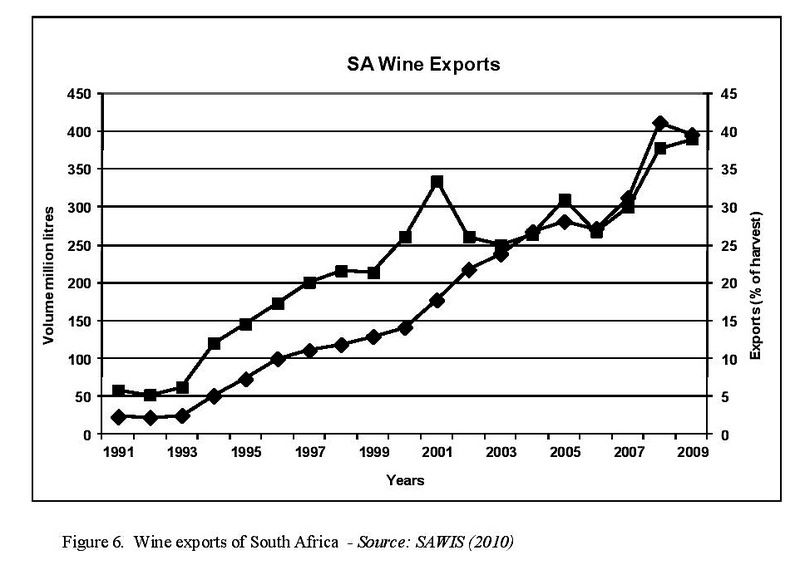 The history of the South African wine industry (Figure 6) serves to illustrate that low-tech South African producers or providers of differentiated products and/or services can be globally competitive. Since 1994 the wine industry has been able to compete successfully in world markets at a time when large parts of the agricultural sector were subject to extreme competition. The wine industry even managed to export successfully during the serious worldwide economic problems of 2008 to 2010. This industry is the prime example of a successful and sustainable low-tech industry in South Africa. Much can, therefore, be learnt from the successes of this industry, particularly that the talents of a few can provide sustainable livelihoods for many, e.g. in the Western Cape (Troskie 2010). An important part of the success of this industry is directly attributable to the fact that its products can be differentiated from those of its competitors and that it meets the success criteria of Toerien (2005: 157-169), which allow price premiums to be achieved in many cases. The question is how the lessons from this industry can be internalised in South Africa if there is little appreciation of the basic reasons for its successes? Further critical lessons have been learnt in this industry. For instance, there are a number of examples of successful small farmer involvement in this industry. Can the learning from these successes be maximised, what policies would enhance the success rate, and what are the ethical implications of such policies? South Africa’s biggest conundrum has the following dimensions. The country needs foreign exchange to fund the import of products and services that the country cannot supply by itself. Its exports to earn foreign exchange consist mostly of commodities (Table 1). Globalisation is forcing the commodity-based South African exporters to become more technology-intensive in order to remain price competitive. As a result, commodity-focused industries replace low-level workers with machines to achieve higher productivity. The redundant workers are mostly poorly skilled and schooled and have not been prepared for alternative careers. Politicians and government officials seem to have little understanding of the role of technology and the need for strategic positioning to build successful competitive low-tech enterprises; hence their economic development strategies rarely include strategic technological and competitive considerations. A case in point is the Second Industrial Policy Action Plan (the so-called IPAP 2) released in 2010 (Department of Trade and Industry 2010b: 36-56). This report does not reflect on the need to have globally competitive and sustainable low-tech enterprises in South Africa but rather pre-selects a number of industries for special attention without real deliberation on how these industries will become globally competitive. 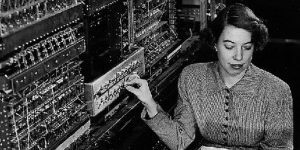 The lack in the report of consideration of the nature of technologies and strategic positioning is disconcerting. Simultaneously workers and their unions use political pressures to try to prevent worker redundancies, thereby endangering the survival of low-tech South African commodity-based enterprises and industries. Other commodity enterprises are under the same competitive pressures and have little, if any, capacity to take on redundant workers, or if they do, the same dynamics occur once again (Figure 2). Inevitably economic growth without employment growth (i.e. jobless growth) follows, a situation that has endured for decades. Where can solutions be found? The South African government has focused on an extended public works programme to provide large numbers of low-level workers with some income, and is in the process of strengthening it. This has done much to provide short-term work for the unemployed. However, in the long run such a programme does not provide a sustainable solution for the conundrum. A way has to be found to change the balance of the economy, a fact acknowledged in IPAP 2 (Department of Trade and Industry 2010b: 4-12). A solution that is not being actively pursued at the moment presents itself, based on the ideas and results discussed here, but it requires a significant paradigm shift in the minds of many stakeholders and role-players. Firstly, the South African government (politicians as well as officials) and role-players such as trade unions have to accept that two primary challenges have to be handled simultaneously, namely the challenge to earn foreign exchange to pay for imports as well as the challenge to provide decent (sustainable) jobs for large numbers of unskilled and poorly schooled unemployed people or menial workers presently serving many of the commodity-based industries. 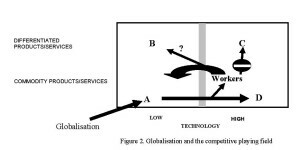 Meeting the former challenge requires the continued use of better technology (moving enterprises from domain A towards domain D, see Figure 2) but this will make workers redundant. These workers have limited training, cannot be shifted to domain C enterprises and often live in rural areas (particularly when shed by agriculture). To create decent work opportunities for these workers, employment opportunities must be created in domain B. The success of the wine industry (and many other examples from rural South Africa, see Toerien 2005: 140-156) suggests that it is possible to achieve this in South Africa. However, many rural towns have performed poorly in starting new enterprises that add value to primary products, e g. towns in the semi-arid Karoo of South Africa (Toerien and Seaman 2010: 28). Therefore, significant government involvement in the design and implementation of appropriate support systems and programmes is a prerequisite. Enterprises that are not tied down to particular locations are called footloose. They can set up more or less anywhere (Allen 1992: 306-7). The term creates the impression that these enterprises cannot be planned for; that they arise as if ‘phoenixes from the ashes’. Toerien (2005: 157-170) contests this view and suggests that once the critical success factors are understood, the successful founding of such enterprises (and even clusters of such enterprises) becomes possible. The enterprises of the ‘Creative Economy’ are often footloose. For instance there is no reason why Hollywood, the primary location in the world for the movie industry, should be located in southern California. Nor is there a specific reason why Kapula Candles, a world-class candle producer, should be located in Bredasdorp in the southern Cape of South Africa. The size of the ‘Creative Economy’, which Howkins (2007: 86-7) estimated at $US 2 709 billion (for 2005) or 6.1 percent of the global economy, is huge. Many regions and countries can benefit from the ‘Creative Economy’, including South Africa and its rural hinterland. The challenge for the government is to promote both, benefiting simultaneously from commodity exports as well as from domain B enterprises. Assistance (financial and otherwise) should be given to commodity-focused enterprises to help them use modern technologies to maintain and improve their price competitiveness, even if it is fully well known that workers will be made redundant in the process. The government should therefore have programmes in place to foster domain B enterprises and industries by providing appropriate support programmes (business support systems, tax incentives, training programmes, etc.) to establish such enterprises and to move workers made redundant in commodity-based industries there. Politicians and officials will have to design and implement the right policies to meet these challenges. Many other role-players will also have to change their paradigms and behaviour. For instance, labour unions will have to limit their objections to technological improvements for commodity exporters and consequential worker redundancies, instead seeking opportunities to extend their memberships in domain B enterprises. Tertiary education institutions will have to institute programmes to provide sufficient numbers of talented professionals such as designers, artists, writers, chefs, wine makers, etc. as well as qualified public officials and business leaders trained in the skills needed to expand domain B enterprises, including the understanding of the principles of building clusters of such enterprises. Lastly, the owners/shareholders of domain A enterprises that are assisted by government to improve their technologies in order to remain globally competitive would need to realise that this would not be ‘freebie’ assistance. In exchange these owners/shareholders would have to agree to equip their workers with skills in case they were made redundant. They would have to provide timely training in skills (technical skills, life skills, etc.) that would assist these workers to make the necessary transitions if needed. The challenges for South Africa are immense but not impossible. With the necessary paradigm shifts and dedication, the bane of ignorance and disregard can be overcome. Daan F. Toerien – Senior Research Associate at the Centre for Development Support (CDS), University of the Free State, Bloemfontein, South Africa. Allen, R.C. (1992) What is a footloose industry? An issue in semantics. Area 24(3): 302-308. Aliber, M., Greenberg, S., Eveleth, A., Kleinbooi, K., Lahiff, E. and Tom, B. (2006) Rural municipality case studies: land reform, farm employment and livelihoods. Summary of Research Reports, Supported with funding from the National Treasury, USAID and the Human Sciences Research Council (HSRC), July 2006, Human Sciences Research Council. ANC Today (2009) Letter from the President: We remain committed to taking the economic transformation forward, ANC Today 45: 1. Arndt, C. and Lewis, J.D. (2000) The macro implications of HIV/AIDS in South Africa: A preliminary assessment. South African Journal of Economics 68: 856-887. 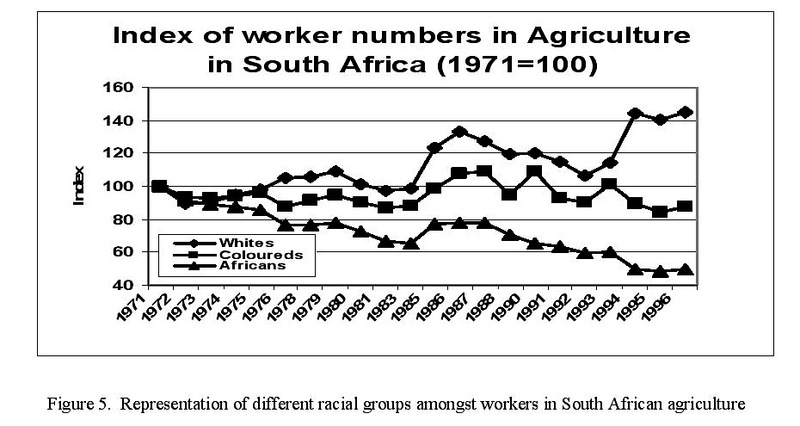 Atkinson, D. (2007) Going for broke: The fate of farm workers in arid South Africa, Cape Town: HSRC Press. Banerjee, A., Galiani, S, Levinsohn J. and Woolard. I. (2006). Why has unemployment risen in the New South Africa? Working Paper No. 134. Harvard University Center for International Development, Cambridge: Harvard University. Barker, F. S. (2003) The South African labour market (4th ed.). Pretoria: Van Schaik Publishers. Bhorat, H. and Cassim, R. (2004) The challenge of growth, employment and poverty in the South African economy since democracy: an exploratory review of selected issues. Development Southern Africa 21(1): 7 – 31. Bhorat, H. and Oosthuizen, M. (2006) Evolution of the Labour Market: 1995-2002 In: H. Bhorat and R. Kanbur (2006), Poverty and Policy in Post-Apartheid South Africa, Pretoria: HSRC Press, pp. 143-200. Brooke Simons, P. (1992) Nederburg: The first two hundred years, Cape Town: Struik. Burger, R. P. and Woolard, I. (2005) The state of the labour market in South Africa after the first decade of democracy, University of Cape Town, Centre for Social Science Research Working Paper, No. 13. Department of Agriculture (2008) Abstract of agricultural statistics, Agricultural Information Services, Pretoria. Department of Trade and Industry (2010a) South African trade by HS 4 digit codes, http://www.dti.gov.za/econdb/raportt/rapExHS4.html, accessed on 16 March 2010. Department of Trade and Industry (2010b) Industrial policy action plan 2010/11 – 2012/13, Pretoria, February 2010. Du Plessis, S. and Smit, B. (2007) South Africa’s growth revival after 1994, University of Stellenbosch, Bureau For Economic Research, Economic Working Papers, no. 01/06. Du Toit, C.B. and Koekemoer, R. (2003) A labour model for South Africa, The South African Journal of Economics 71 (1): 49 – 76. Fedderke, J. W. and Szalontai, G. (2003). Industry concentration in South African manufacturing industry: trends and consequences, 1972-96, University of Cape Town, Centre for Social Science Research Working Paper 05/105 [Online]. Available at: http://www.cssr.uct.ac.za. Fine, B. and Rustomjee, Z. (1996) The political economy of South Africa: from minerals-energy complex to industrialisation, London: Hurst & Co.,. Ford, C., Lewis, G. and Bates, B. (2002) The macroeconomic impact of HIV/AIDS in South Africa, in: Kelly, K., Parker, W. and Gelb, S. (Eds) HIV/AIDS, economics and governance in South Africa: key issues in understanding response. A literature review: Johannesburg and Grahamstown: The Centre for AIDS Development, Research and Evaluation (Cadre) on behalf of USAID through the Joint Center for Political and Economic Studies, pp. 10-17. Gabler, J. M. (1995) Passions: the wines and travels of Thomas Jefferson, San Francisco: Bacchus Press. Hessequa Municipality (2005) Hessequa local economic development (LED) strategy, Report prepared by Octagonal and Vecon, Somerset-West. Howkins, J. (2007) The creative Economy: how people make money from ideas, London: Penguin Books. Kennedy, P. (1993) Preparing for the twenty-first century, London: Fontana Press. Pauw, K., Oosthuizen, M. and Van Der Westhuizen, C. (2008) Graduate unemployment in the face of skills shortages: a labour market paradox. South African Journal of Economics, 76(1): 45-57. Ponte, S. and Ewert, J. (2007). South African Wine – An Industry in Ferment. Tralac Working Paper No. 8. [Online]. Available: www.tralac.org. Porter, M. (1980) Competitive strategy: techniques for analysing industries and competitors, New York: The Free Press. Porter, M. (1985) Competitive advantage: creating and sustaining superior performance, New York: The Free Press. Porter, M. (1990) The competitive advantage of nations, London: MacMillan Press. Rifkin, J. (1996) The end of work: the decline of the global labor force and the dawn of the post-market era, 1st paperback ed., New York: Putnam. Smet, K. (2007) Stuck in the middle? 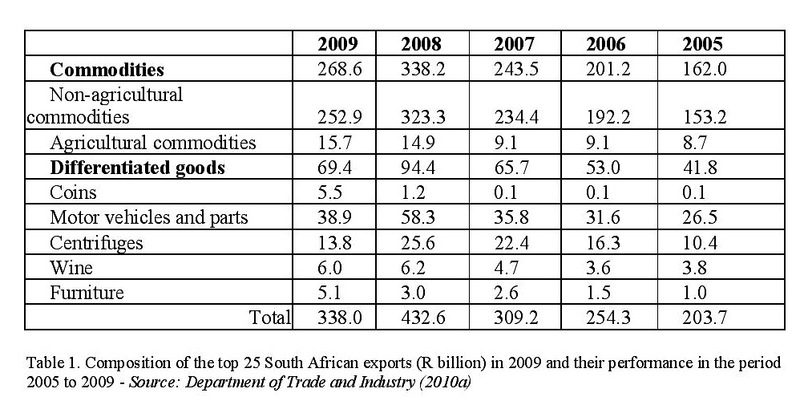 The structure of trade between South Africa and its major trading partners. Vienna University, Department of Economics Working Paper Series 117, pp. 1 – 27. South African Government (2010) Land Reform. Accessed on-line at www.etu.org.za /toolbox/docs/government/land.html on 23 June 2010. South African Government Information (2010) President Zuma convenes third meeting of Black Economic Empowerment (BEE) Advisory Council: 20 May 2010. Accessed on-line on 23 June 2010 at www.info.gov.za/speeches /2010/10052014451001.htm. South African Wine Industry Council (2007) The Wine Industry Transformation Charter. Stellenbosch: SAWIC, 30 July 2007. 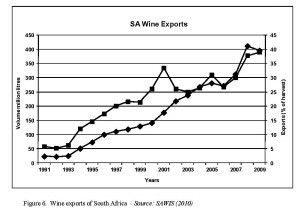 South African Wine Industry Information and Systems (SAWIS) (2003) Macro-economic impact of the wine industry on the Western Cape. Pretoria: Report by Conningarth Consultants. Statistics South Africa (24) Census of Commercial Agricultural of 2002, Pretoria. Stiglitz, J. E. (2003) Globalisation and its discontents, New York: W. W. Norton. Toerien, D. (2005) Taming Janus: Technology, business strategy and local economic development, Stilbaai: DTK. Toerien, D. F. and Seaman, M. T. (2010) The enterprise ecology of towns in the Karoo, South Africa, South African Journal of Science 106 (5/6): 24 – 33.